Battle Baptist Football Club is through to the final of a national knockout competition following a victorious trip to Liverpool on Saturday. 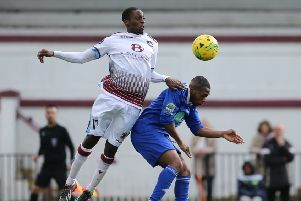 The East Sussex League Premier Division high-flyers reached the National Christian Cup final courtesy of a 2-1 semi-final win away to Bankhall Mission. The date and venue for the final are yet to be confirmed, but Battle will face the winners of the all-Liverpool semi-final between Bethel Church and St Sebastians at some point in May. Battle arrived in Liverpool full of hope, but were probably the underdogs due to the long journey they had made. The Baptists travelled with a strong 15-man squad, which included Zak Hurst, who returned to the first team after a number of good performances for the second team in recent weeks as Glen Carrick was unable to travel. Bankhall Mission showed from the start they were going to be physical and put themselves about with some interesting tackles early on. After some expected early nerves, Battle managed to settle and enjoyed plenty of possession without really troubling the Mission goalkeeper. By the 10-minute mark it became evident that Mission’s game plan was to go long via one of their three centre-halves and look to win the first or second ball. Battle’s defenders dealt with most of them without any problems. The first half continued to be a rather cagey affair, with neither team really creating any good chances. Battle, who made their first change in the 15th minute when Michael Booth took a heavy knock on his ankle and was replaced by Corey Wheeler, probably edged the possession and looked the more likely to create an opening. At half time the Battle management asked for the players to remain calm and stressed that chances would come. They were challenged to go up a couple more gears from the start of the second period and not become complacent at any time. Battle duly started to get on top and produced a dominant half-hour of football. But with chance after chance coming and going, you wondered if it was going to be one of those games when missed chances would come back to haunt the club. But the breakthrough came on 65 minutes. Following a free kick, the ball came to Jamie Lindsay, who struck a left-footed shot from 30 yards which looked as though it was heading into the top corner. The Bankhall goalkeeper pulled off an amazing save only for the ball to rebound out to Adam Staplehurst, who directed a diving header into the roof of the net. Battle pushed on in pursuit of a second goal and after more missed chances, it eventually came with 12 minutes to go. That man Staplehurst was at the back post to head Dean Boyd’s corner into the roof of the net for his 11th goal of the season. Battle let the opposition back into the game when goalkeeper Connor Saunders fouled the Bankhall striker, who slotted it home the resulting penalty to make it 2-1. Bankhall threw everything at Battle in the final five minutes and hit the crossbar, while Battle had a chance to put the game to bed at the other end. After four minutes of added time, the final whistle blew and Battle could celebrate progressing to the final. Battle: C. Saunders, Rafati, Gooch, Vinall, T. Saunders, Staplehurst, Lindsay, Hurst, Boyd, Cuddington, Booth. Subs: Brister, Wheeler, Pickering, Jeffs.